Royal Caribbean plans to make 69 stops in Portugal this year, of which 34 are in Lisbon, 24 and 11 in Ponta Delgada, Royal Caribbean Director Francisco Teixeira said this morning on board the Independence of the Seas, the ship that most often visited the capital of Portugal in 2012. Royal Caribbean will bring a fleet of five ships to Lisbon, with the vast majority being the aforementioned Independence of the Seas, with 25 stops, then it is the Vision of the Seas on five occasions, the revitalized Splendour of the Seas, Brilliance and on two dates and Grandeur of the Seas, which will come once every to Lisbon. In total, Francisco Teixeira says Royal Caribbean will move about 200,000 tourists through Portugal. 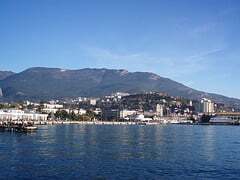 Reconstruction of the port of Yalta, Ukraine will begin after it is approved by the Ukraine Law of Sea Ports. Vice-Premier of Ukraine - Infrastructure Minister Borys Kolesnikov expects this to happen sometime next month as he was speaking at a press conference in Simferopol. "This is a technical problem. In order to move quickly, you need to pass a law on seaports that will guarantee the rights of investors, " said Boris Kolesnikov. He added: " The law is already in Parliament, on the whole procedure will take about 25-30 days, then return the draft to Royal Caribbean. Royal Caribbean has previously shown a great deal of interest in revitalizing the ports of Yalta and Sevastopol. Royal Caribbean is looking to compete with other cruise lines for the Black Sea cruise market. Improving the ports is expected to involve improving the infrastructure of the ports as well as building new restaurants, hotels and other facilities nearby. In Italy in 2012, Royal Caribbean will have five ports of embarkation in Italy, of which two are new this year: Bari & Messina. These new ports of embarkation are in addition to Civitavecchia, Venice and Genoa. In addition, there will be 10 ships in Italy this year, up from 8 in 2011, including Navigator of the Seas and Mariner of the Seas. Royal Caribbean Italy kicks off the summer season by announcing the addition of Mario Pasquero as new commercial manager, responsible for marketing departments and web operations. Also, new cruises from Venice and the new home for Splendour of the Seas, Bari. Royal Caribbean is also offering new "flight + cruise" packages where you can fly at reduced rates to the ports in Northern Europe where cruises aboard Brilliance of the Seas area available. More details were released today about the 13 Royal Caribbean passengers from Serenade of the Seas that were involved in an accident. The safari taxi, part of Royal Caribbean's "Best of St. Thomas and Shopping" (a three-and-a-half hour shore excursion), darted from Skyline Drive on Friday morning, levelling mailboxes, striking a parked SUV, launching itself over the ridge and plunging 65 feet into thick bush. St. Thomas Deputy Police Chief Dwayne DeGraff said one woman broke her hip while another passenger required stitches for a cut on their forehead. Only the woman with the broken hip did not return to Serenade of the Seas to complete the rest of their cruise. Officials say The west-bound taxi veered left at an uphill right turn and struck a bank of mailboxes and the side of an Acura SUV parked in a driveway.The taxi then climbed the ridge and careened downhill into bush beside a concrete driveway on the southern slope. The driver of the taxi, whose name was not disclosed, had no other charges against him/her. The driver was cited with a commission violation but is authorized to operate a taxi. The accident remains under investigation by the V.I. police. Officials from the U.S. Virgin Islands in St Thomas report that a tourist bus carrying at least 13 cruise ship passengers has collided with a parked vehicle. 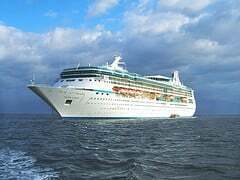 The passengers, from Royal Caribbean's Serenade of the Seas, collided with the parked car. The accident occurred in an open-air "safari bus" on a steep road near the island's scenic Beacon Point. St. Thomas Tourist Department spokeswoman Allegra Kean-Moorehead says one of the injured is a female passenger who had to be hospitalized with a hip fracture. Twelve other passengers were released after being treated. 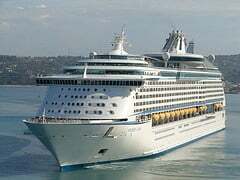 She also said that Serenade of the Seas is still expected to depart late Friday without the injured passenger. Royal Caribbean's Chairman Richard Fain has personally looked around the new International Cruise Terminal in Singapore and likes what he sees. Fain has been told that the new terminal will be ready for the arrival of Royal Caribbean's Voyager of the Seas when she arrives on May 26 for her debut in Asia. Previously the Singapore Tourism Board had only indicated that the new terminal would be ready in the second quarter of 2012. "Because the ship is coming in late May, I was assured the terminal would be ready for the voyage of the ship," Fain said. "It's also very efficient. That's important in the cruise industry. It's gratifying to see how well-thought through the logistics are: How passengers come in, how luggage is handled, the supplies to the ship. There are commodious areas to handle all the activities that need to be attended to. They are all well-thought out in a progressive way." Voyager of the Seas' first cruise from Dubai to Singapore is already sold out, which has exceeded expecations according to Fain. For the first time ever, Royal Caribbean is offering cruises to the island of St. Vincent in the Caribbean. 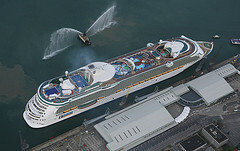 Vision of the Seas will sail to the island as part of new 11-night itineraries out of Fort Lauderdale, Florida on Dec. 3, Dec. 24 and Feb. 4, 2013. 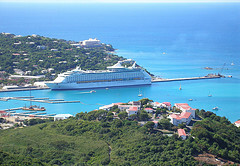 The St. Vincent cruise is just one of 19 new itineraries to the Caribbean and Panama Canal cruises that were announced for the 2012-2013 season. Consumers can also choose from new 10-night Eastern Caribbean ships that include stops at Martinique. Royal Caribbean's Vice President of Latin American Relations, Michael Ronan, met with Cozumel, Mexico's Mayor Aurelio Joaquin Gonzalez, where Royal Caribbean continues to be impressed by Cozumel's incomparable natural beauty, high safety standards and hospitality offered by the island as well as having one of the best worldwide port infrastructure, which facilitates the operation of mega ships. Ronan went on to say that rather than looking to reduce cruise routes to Cozumel, Royal Caribbean will keep Cozumel as one of their favorite destinations around the world. Michael Ronan added that it is not by chance that Cozumel holds a strong leadership at national and international level in cruise arrivals, under which has great natural beauty, is one of the safest destinations, offers high quality and hospitality of its people. "But also, the island has one of the best port infrastructure in the world and under very special conditions that allow so-called mega-cruise ships, as the" Oasis of the Seas ", to operate smoothly, leading to the arrival of as many tourists to the island. 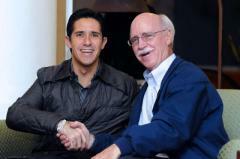 For all that Cozumel is and will remain one of our destinations, "he said. Royal Caribbean's Allure of the Seas made its first stop at St Kitts-Nevis on December 30, which St. Kitt's Tourism Minister described as "an historic event". Rich Skerritt, the Tourism Minister for the island, spoke to The St. Kitts Nevis Observer about the occasion, "Almost the entire population of Nevis can be housed aboard this one vessel. This is a strong indicator of the growth of our relationship with Royal Caribbean Cruise Lines and the cruise industry in general. This is also a reminder of our responsibility and the expectations which have been raised of our port to deliver a quality destination experience for cruise passengers and all visitors." Cruise passenger numbers have increased over the last four years at St. Kitts along with passenger satisfaction levels. Allure of the Seas' arrival also drew St. Kitts' Prime Minister Hon. Dr. Denzil Douglas, Minister Skerritt and other government officials, who attended a cocktail reception and plaque & key exchange ceremony aboard Allureof the Seas. 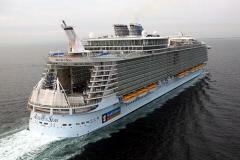 Royal Caribbean's mega ship the Allure of the Seas is going to visit the island of St. Kitts. Sunday will offer passengers an unique 9-night itinerary that will deviate from the usual pattern Allure of the Seas visits and will include docking in Basseterre, St. Kitts on December 30. Royal Caribbean CEO Adam Goldstein described the visit to St. Kitts in a recent blog post as a variation on the typical itineraries that Royal Caribbean will offer from time to time. Royal Caribbean spokesman Harrison Liu calls the visit "uniquely special", as there are no other calls to St. Kitts planned for Allure of its sister ship Oasis of the Seas. In celebration, the island is planning a festive welcome for Allure of the Seas. The celebration will include St. Kitts and Nevis' prime minister, tourism minister and other top officials will be greeting the ship.